If someone had told you four years ago that the PS3 would be later to market and larger in size than a 360 you’d have told him to put his Microsoft-loving lips firmly onto your posterior. Now it’s your turn to kiss a little bum, as Games Radar has pictures of an Xbox 360 side-by-side with a PS3. 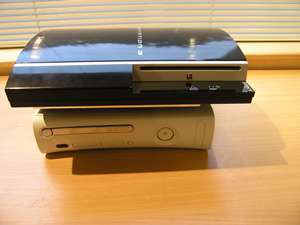 As you can see, the PS3 is wider, thicker and taller than its white counterpart. The sleek demo-unit we saw at E3 in 2005 is long gone, probably eaten by this giant of a machine. Check out the full gallery on Games Radar for more insight on how the PS3 has let itself go.